Before embarking on my weekend of terror (okay, not terror for me, more like terror for those who are unfortunate enough to be around me) I wanted to make dinner for mom and me. In part because I have not made dinner in a long time, and because I enjoy trying out recipes from magazines. Otherwise I feel like I've spent $5 to look at pictures when I could do that for free (or I guess the monthly fee for the connection) online. I suppose the glossy pages and articles about gadgets and restaurants and markets (like the article about La Boqueria in Bon Appetit the day after we returned home) are the real reason. Valentine's Day is traditionally a couple meal, so I figured finding a plan from Valentine's Day, with the weather about right for that occasion, would give me a recipe that would require little altering. I was wrong, but at least the grocery list was simple (8 ounce container of this, 5 ounce bag of that). 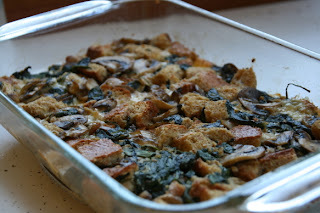 The recipe was for a Spinach-Mushroom Strata, but I made it so shallow I felt like it should be dressing. Or possibly pudding. Because pudding sounds tastier. Or more like dessert. (Though I did find a definition of pudding that this dish would fit: any of various soft thick unsweetened baked dishes). But maybe I should get on with the food. Like I was saying, despite choosing a recipe for two people so I could follow it to a "T", I still ended up changing it. Due to liquor laws and the lack of sherry in the liquor cabinet, I decided to do without (I couldn't have paid someone at the store to buy it for me, but that would make the dish unsavory.) The recipe also called for grated Swiss cheese and I'm not a fan of Swiss cheese, so I had to do something about that as well. Also, since I'm lazy, I had to do away with the French bread with the crusts removed and went for a softer bread instead. And it turned out delicious, unlike the broccoli rabe recipe that I followed much more closely (though I did accidentally end up boiling, not blanching, the greens; I think I just like citrus with broccoli rabe). Preheat oven to 350F. Grease a 2 qt. shallow baking dish. Heat oil in nonstick skillet over high heat. Sauté mushrooms for 5 minutes or until browned. Add garlic and thyme, and cook one minute. Stir in vinegar and cook until liquid evaporates. Season with pepper (and possibly a bit of salt) and tranfer to a bowl. Place pan over high heat (same pan would be nice). Add spinach and a tablespoon of water or broth (but not from the 1/2 cup) and cook a minute, or until spinach wilts. Season with salt and pepper (only pepper if you used broth). Squeeze out liquid. 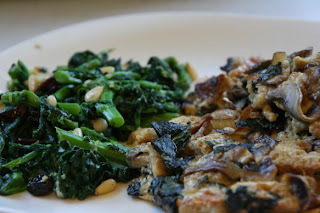 Toss spinach and bread with mushrooms. Whisk broth and egg together in a small bowl. Pour over bread mixture, add cheese, and stir until all the liquid has been absorbed by the bread. Spoon into prepared baking dish and press down lightly. Bake 30 minutes or until browned and bubbling. Let stand 5-10 minutes to set, and then serve.